Many of the mothers I work with express a fear of driving alone with their less than 4 month old infant around Los Angeles. They’ve experienced, at least to some extent, the shrilling cry of their carseat-confined baby, and the feeling of panic at not being able to get to soothe them while driving. When they can finally stop the car and get to baby, they feel a lot of guilt and worry that this experience was traumatizing for the infant. Moms brace themselves before heading out to do any errands with baby, and feel trapped and ashamed of their car ride phobia. Depending on temperament, some babies are more easy going with car rides than others. And, after the 4 month mark, most babies are able to tolerate car trip discomfort with more finesse; but if your baby seems to freak out as if they are left alone in a cold wet dungeon everytime their trapped in their backseat container, here are some tips to get you by when you want to be brave and venture out with them solo. Plan car trips around nap times, and put baby down to sleep in the car seat. 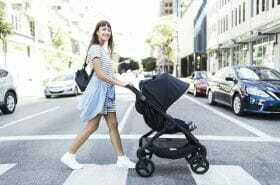 Bring the car seat into your home, and either put baby to sleep in the car seat or transfer him to it prior to getting to the car, so he doesn’t even notice you’re sneaking away together. Make sure baby isn’t hungry. Your baby is more likely to be comfortable and pleasant if he’s well fed while on the road. This may seem obvious, but it’s easy to not realize how much time has actually passed since the last feeding, and by the time you get everything together and get out of the house, it’s only another 15 minutes before hunger strikes. Create positive associations during car trips. Positive “sleep” associations are those things that are constants for baby while sleeping (noise makers, blankies, thumbs, dim lighting, a rocking motion etc.) So, create associations for car riding that soothe baby and remain constant throughout the trip. These things help baby familiarize himself with the car environment and begin to associate it as a calm and happy place. Some examples are the essential back seat mirror, through which baby can see your reflection (and you can keep an eye on him), a travel noise machine, a familiar gentle song on replay, or a favorite blanket or lovey. Keep the car seat canopy up to minimize stimulation and provide dimness. Pacifiers generally don’t work because they fall out, and you’ll be unable to help baby get back to it, and it’s best not to use toys or anything else that can be a potential safety hazard, or drop down leaving baby helpless to retrieve it. Pullover if necessary. It’s OK to pullover and get in the backseat to soothe your baby. LEAVE EXTRA TIME for this, say 30 minutes. Take back roads wherever you’re going (not highways) so that you can safely pullover and either take your baby out of the seat and rock him or feed him if needed. Bring a travel nursing pillow, burp cloth, bottle, and whatever else you might need to soothe your baby for a few minutes before putting them back in the seat and continuing your journey. This will be reassuring for your baby, and better for you so that you don’t rush or panic, potentially making driving unsafe. Adjust your expectations. The first three months of your baby’s life are a time a big adjustments for the whole family. Baby has not yet formed consistent patterns and his body is learning how to regulate, digest, etc. which can make him fussy at home or anywhere for no apparent reason. Because of this, staying put is often the most convenient and logical option. You’re likely to be less mobile during this time, and may feel more prepared for this if you set realistic expectations. Plan to take a quick walk for some fresh air, do more home based activities, and either make less plans or have to cancel them on occasion. Don’t be fooled by your own fear that you’ll never be able to go out and about again freely if you can’t just yet. As your baby matures, he or she will be more capable of soothing themself and more able to take in your attempts to reassure them in the car. I always tell my patients to follow their intuition first and foremost, and in motherhood this is especially important. If you feel that the car rides are just too stressful for you and your baby, don’t heed to the pressure of others who may want to see you, or to those who may judge your decisions. Lastly, and incase you were wondering, your baby isn’t being traumatized by a difficult car ride experience, and won’t (consciously) remember it. If you do end up on the highway with a screaming newborn in the backseat, remember to keep yourself calm (BREATHE), and baby is likely to cry himself out and fall asleep. Good luck! issues, work/life balance, parenting, trauma, grief & mourning, sleep issues, sexual concerns, self esteem, and self confidence. She empowers her clients with the tools to become their authentic self, and encourages them to grow by developing compassion for themselves, others, and life.